Disclaimer: No one gave me diddly squat for mentioning them. First of all, I recommend registering for the BOOST cafe. It is totally free. All you need is an email address. BOOST stands for Best Of Out of School Time. They run a really good conference, but even if you can’t afford to go their site is available all year. Youth Service America, including my favorite page of 15 easy and free projects. It’s my favorite because, frankly, lots of those more elaborate projects never get done because the teacher or parent does not have the resources to collect 120 egg cartons or whatever. Also, because in Belize, kids really don’t go to school because they don’t have school supplies, so those easy projects can make a big difference. Mindworks offers a lot of free resources on their site. Obviously, their intent is to sell their kits, but you can get a lot of good ideas for classroom activities, like this one from Project Wild on understanding the animal kingdom, and you don’t necessarily have to buy their kits to implement these. Though, if you have the money, their kits do look pretty cool. Another one that offers a lot of free resources is mathbuddy.com . My favorite is their Question of the Day, which you can pick by grade level. Almost last but not least is livebinders.com . I’ve mentioned them before as a resource for teachers to use in organizing their lessons but you can also search the public binders on the site. These are not reviewed, so, like teachers in general, you will find some to be great, a lot of good and some not-so-good. Many of the binders will have links that are obsolete, but like any good treasure search, patience is rewarded, like in this binder on equivalent fractions, decimals and percentages, which I thought was terrific. I saw that the same author had several other binders, so I’m going to check those out as well. 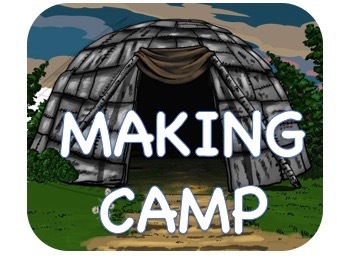 Finally, of course, I have to mention Making Camp, which is a free app from yours truly that teaches multiplication, division, word problems, math terms and Ojibwe history and culture. It’s also our fastest growing game. We also have free demos of games for higher grades you can check out.